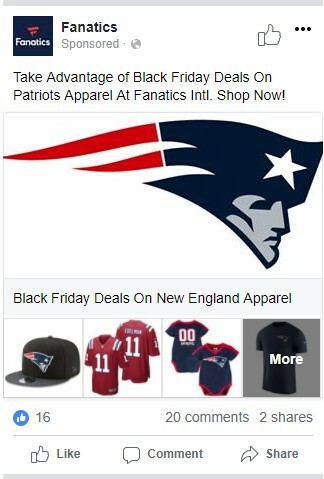 Fanatics is the global leader in licensed sports merchandise. They extended their business by acquiring UK-based sports e-commerce company, Kitbag in 2016. We help both brands grow online sales through our international digital marketing services. Black Friday and the 2017 holiday shopping season were crucial for an e-commerce business like Fanatics. The sales goals for the period were high, and the wide range of products (over 75,000 types of kit and merchandise in each market) presented a unique set of challenges as the offers were updated frequently over the peak shopping period. While AdWords and Google Shopping are obvious marketing channels that deliver a steady flow of clicks, we realised the campaigns needed to grow laterally in order to meet the higher targets. We devised a strategy that broadened the reach of the existing search and shopping campaigns and included launching new campaigns on Facebook. All campaigns were highly targeted, with ad copy that was personalised to the individual market segments, driving visitors to pages on the site where they would see merchandise from the specific teams they supported. Search, shopping, and social media creative was localised for users in Germany, France and Spain. Offers were updated frequently to ensure ads reflected exactly what was on the site. The bid strategy was adjusted to maximise sales volumes while staying well below the target CPA, and budgets were allocated according to local audience affinities. Comparing the key performance metrics in November to the previous month, the 2017 holiday shopping season saw the Fanatics brand in Europe break a number of their own sales records. 212% increase in clicks to the site from marketing campaigns. 613% jump in order volumes. 28.72% decrease in cost per acquisition.